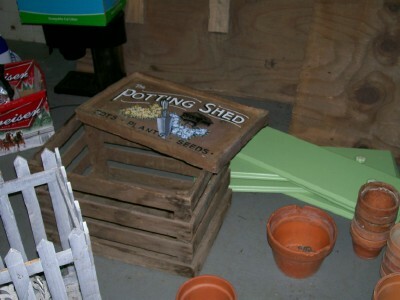 Here are a few more pics from the potting shed. 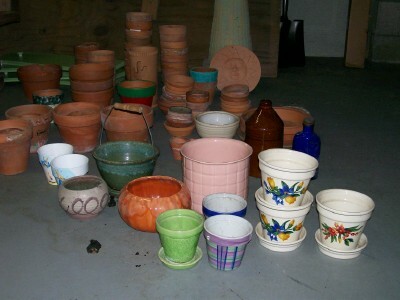 I counted almost 100 clay pots and bases alone. Inside the little picket display thing is and old metal globe from a lamp post. 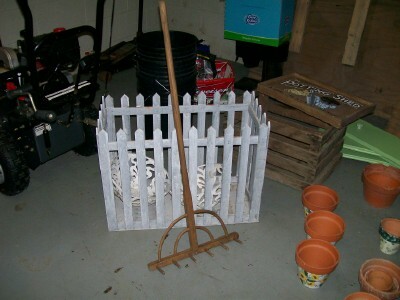 I also got a barrel with many bamboo and fiberglass stakes and dowels. The lime green things are drawer fronts that she used as shelves. They have vintage ceramic pulls on them. I also got a blue Sylvia and a Dusty Miller in large clay pots. I could go on all day. I believe that I got enough stuff to start a little business. I'm thinking spice gardens, Hens and chicks, and who knows? I love your site and I will visit it often. Woman of Many Sticks says: Thank you so much - I wish you all the success in the world with your business venture - you should do really well! See Linda's original post here: Not Sure What This Is.